Wargaming might not yet have replicated the staggering success of World of Tanks with its skybox-scraping sibling, but they’re certainly updating the game with the same frequency and dedication. World of Warplanes 1.6 will welcome a new line of Russian MiG fighters today, as well as an extended map, and a ‘multirole’ class which will make existing planes newly customisable. The Russian MiGs are remembered for their “breakneck” speed and power. 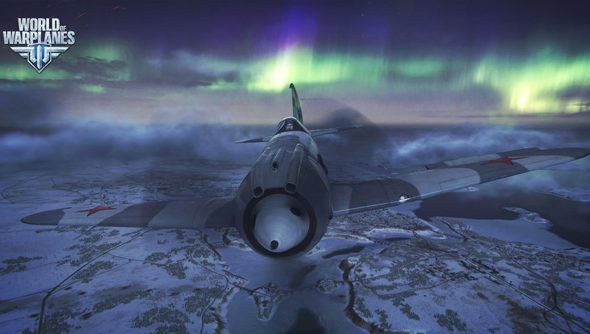 In-game, they’re available as a new line of jets at tier 5, and include the “legendary” MiG-15bis – famous for its early use of the ‘swept wing’ shape seen on many contemporary aircraft. Update 1.6 will also usher in the multirole fighter – designed to straddle air and ground combat. Players will be able to outfit planes with both high caliber guns and bombs. Other jets in the fighter class have been redesignated and rebalanced as ‘pure aerial’ dogfighters as a result. What’s more, the El Halluf map has had its boundaries pushed back. Wargaming reckon it now provides a “more ample landscape for battle”. Incidentally, you can still enter our competition to win a ticket to the Tank Museum and premium Fury Sherman in World of Tanks. Do you think you might?